The best thing about coloring is that you don't need a lot of supplies! 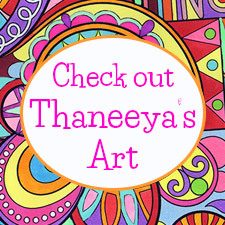 On this page I'll tell you all about my favorite markers, colored pencils, gel pens, or pens that I use for coloring, and discuss the pros and cons of various brands. As you can see from the artwork above, all you need to get started are markers, colored pencils, gel pens, or pens, which you can get cheaply at almost any store! 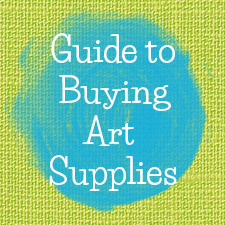 Art supplies can range in price from economical to pricey, so if you're just starting out and you're on a budget, I'd suggest starting with lower-priced brands and then if you want, add more higher-priced coloring supplies later. This page was colored with Copic Markers. Click to enlarge. My favorite brand of markers are Copic. I use Copic Sketch markers, which are refillable - a huge bonus! The colors apply very smoothly, with minimal streaking or lines from overlapping. Copic Sketch markers come with a brush tip and a chisel tip, but I mostly use the brush tip, which comes to such a fine point that it can fill in tiny details. They're also great for filling in large areas with color. 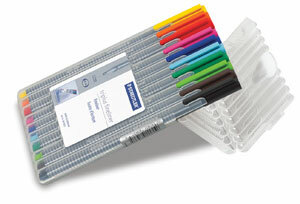 Copics come in a wide range of colors so you can get just about any color of the rainbow. I love that you can get colors that range from soft and subtle to bold and vibrant to deep and dark. The colors can be blended together which is another bonus that you won't find with most other markers. Copics can be purchased individually, so you can grow your collection over time by starting with your favorite colors, or you can invest in a set. The only downside of Copics is the price, but since Copics are considered professional-quality markers, they come with a price tag to match. 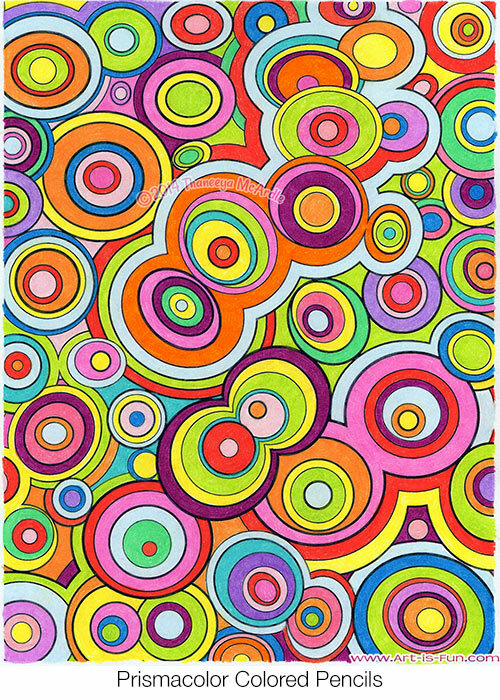 A coloring page done entirely with Sharpies! Click to enlarge. Sharpie colors are bold and vibrant. You can buy them individually or in limited edition sets (such as the 80s Glam Set or the Electro Pop Set). They also come in Neon, which is wonderful for eye-popping color! Of the different types available, I mostly use Sharpie Fine Point Markers (this links to Blick Art Materials, and if you make a purchase I get a small commission that helps support this site). I like that I can get good, smooth coverage with Sharpies. 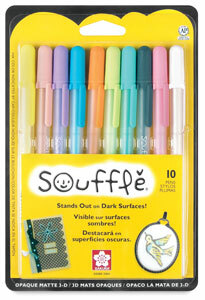 They're also inexpensive and easy to find in stores, so they're a great addition to any coloring supplies collection. 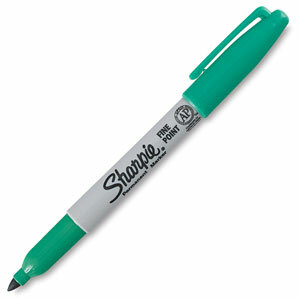 I only wish that Sharpies offered a range of soft and subtle colors, for instance, a light pastel blue, green or pink. Because they lack those subtle pastel colors, I rarely use only Sharpies to color in a page - I use them in combination with other brands and/or media. I only have a handful of Prismacolor markers but I like them a lot. 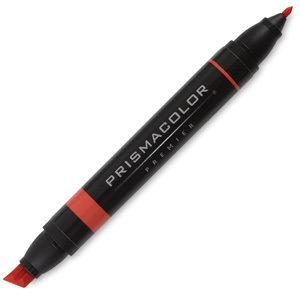 They are also considered artist-quality markers, but they are less expensive than Copics. They're vibrant and come in a wide range of colors. Tombow markers are actually called "brush pens" but to me they feel more like markers. 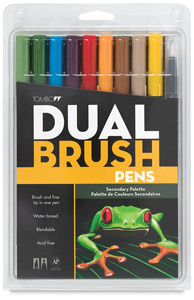 They have dual tips - a pointy brush tip and a hard fine-point tip. I typically use the brush tip to color in fine details and the hard tip to draw in extra details. I don't use Tombows to fill in large spaces because I've found that they can create lines where the marker overlaps (unlike Copics, for example). Yes, Crayola makes my list! Even though Crayolas are meant for kids, they are cheap and vibrant and come in a nice range of colors. They're best for filling in smaller areas rather than large areas, because they leave lines where the marker overlaps. 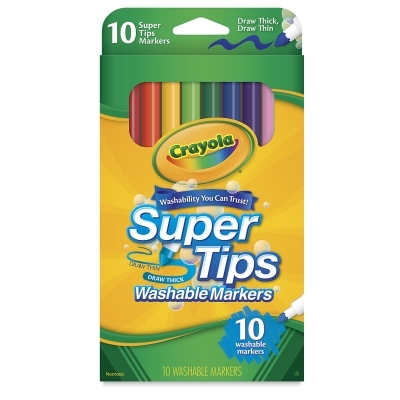 Of the many different types of Crayola markers, I prefer the Crayola Super Tips Markers. The biggest downside of Crayola markers is that the colors do fade relatively quickly (some colors, within days or weeks), as opposed to the other markers I mentioned in this list, whose colors last longer. It's another example of how you get what you pay for. If you don't mind that the colors will fade, then Crayola markers are a wonderfully affordable option for "in the moment" coloring. This mandrill was colored with Prismacolor Colored Pencils. Click to enlarge. My favorite brand of colored pencils is Prismacolor. The colors are so rich and vibrant that if you press them down hard enough on the paper, the finished artwork can look like a painting! Prismacolors come in a wide range of colors that can be easily layered and blended to create new colors and/or to create shading effects. 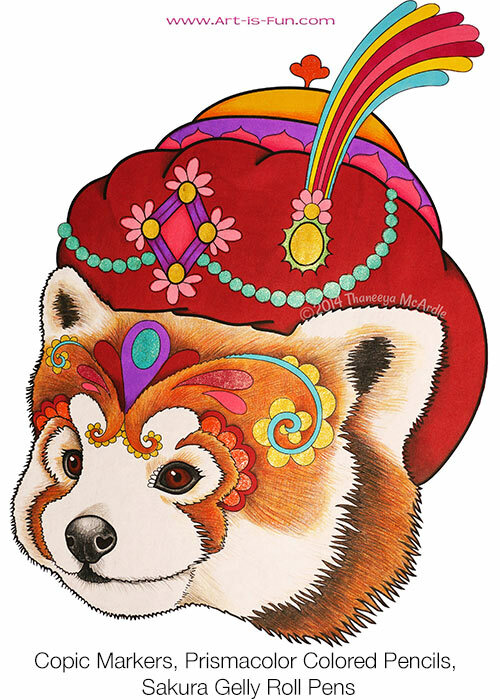 Shading is a fantastic way to add dimension and interest to a coloring page, to make the artwork really pop. In addition to layering colored pencils on top of colored pencils, I often layer colored pencils on top of markers to create shading. Prismacolor have a few different types of colored pencil. 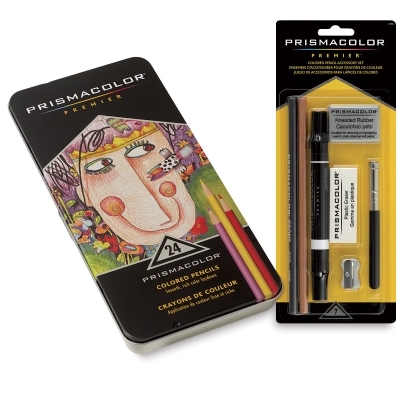 I use and recommend the Prismacolor Premier Colored Pencils (see below), which are professional quality, so they're a little on the expensive side. 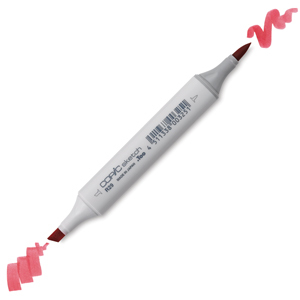 You can buy them individually (around $1.13 each), which is handy when you want to try them out or re-stock certain colors. You can also save some money buy purchasing a set. If you like doing super-detailed coloring, Prismacolor also offer "Verithin" pencils which are designed to be sharpened to a very fine point. If you make a purchase via the links below I receive a small commission, which helps support this site and keep it ad-free! Thanks in advance. Sakura gel pens are my favorite. The ink glides smoothly and they have a fun range of colors and styles, such as Metallic, sparkly Stardust, pastel Souffle and vibrant Moonlight. I love the glittery appearance of the Sakura Stardust gel pens, which is great for adding eye-catching accents to a coloring page. 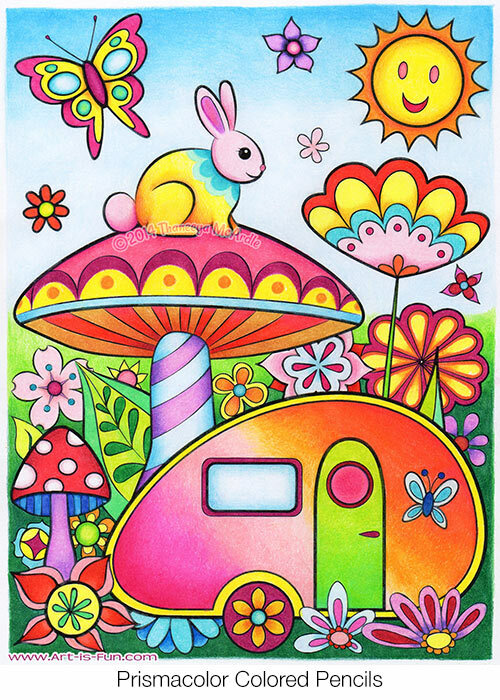 I like to color in areas with marker and then add details on top using a white Sakura gel pen or Souffle gel pens. 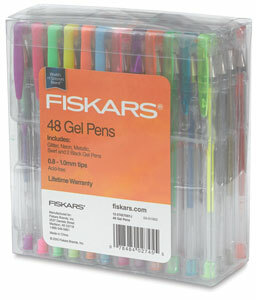 Fiskars is another good brand of gel pens that are quite affordable when you purchase them in a 48-piece set. The colors are bright and include varieties such as neon, glitter, metallic, and swirl. Staedtler Triplus Fineliner pens have super-fine tips so they're excellent for filling in tiny areas of detail with color. They're also great for adding details to a coloring page. They can be purchased individually or in sets. 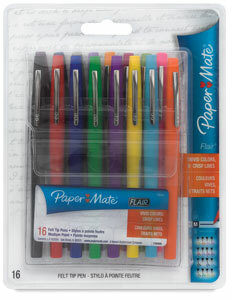 While these Paper Mate pens don't glide as smoothly as the other pens and markers I've mentioned in this list, they do have nice vibrant colors and the tips are small so they can be used to fill in tight spaces or to doodle extra details onto a coloring page. Plus, they're inexpensive - always a plus! Spectrum Noir Artliner Pens are available in a variety of nib sizes, as well as a fine-point brush tip. 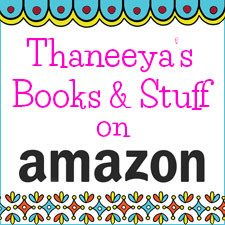 Check out my review, which tests how well they perform for outlining, coloring, and in combination with other media. 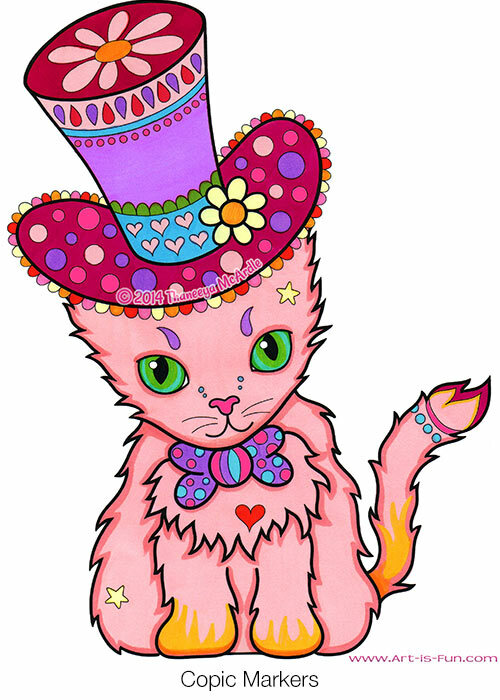 Add a cool metallic sheen to your coloring with Spectrum Noir Metallic Markers. Read my review, which also shows how they look on black and dark colored paper. They can even be used on rocks, wood and glass! 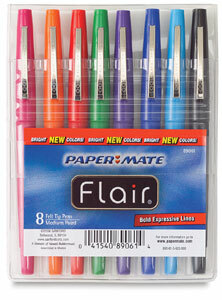 These are currently my go-to art supplies for coloring in the art from my coloring books. I love to experiment with new coloring supplies so I'll be sure to update this list when I discover more cool supplies! 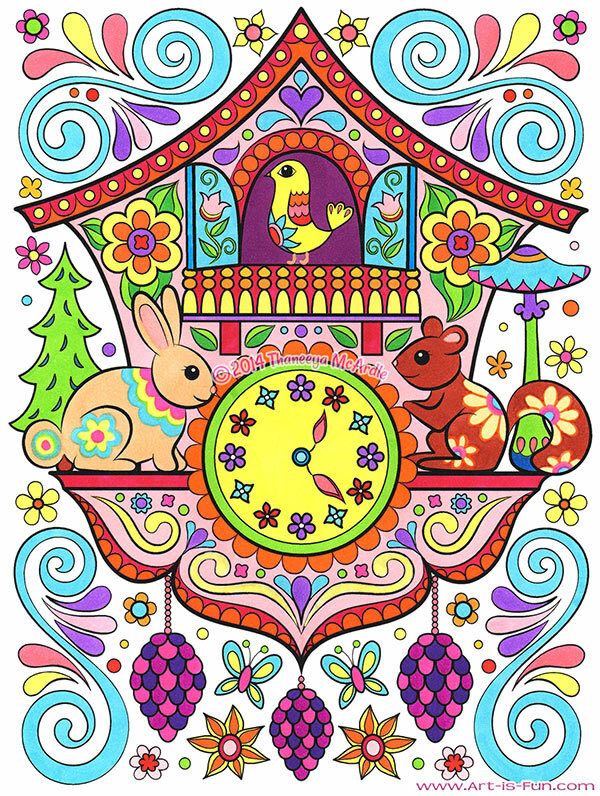 Return to the Coloring page. 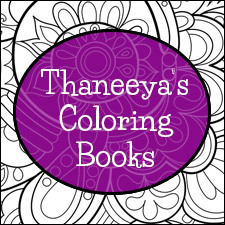 Check out my Printable Coloring Pages and my Published Coloring Books.